Citation: Badal S. 3-Hydroxy-8-Methoxy Flavone-7-O-Α-L-Arabinofuranosyl-(1→4)-O-Β-D-Galactopyranoside from the Roots of Grangea Maderaspatana Poir. Int J Chem Sci. 2018;16(4):293. In the present communication, the isolation and characterization of a flavone’s glycoside, 3-hydroxy-8-methoxy flavone-7-O-α-L-arabinofuranosyl-(1→4)-O-β-D-galactopyranoside, from the roots of Grangea maderaspatana poir has been reported. The plant Grangea maderaspatana poir  belongs to natural order compositae and is known as Mustaru in hindi. It occurs in throughout India. The leaves of this plant are reported to be stomachic, antiseptic, de-obstruent, and is prescribed in infusion and electuary in case of obstructed menses and hysteria. It is also reported to be used in preparing antiseptic and anodyne fermentation and the leaves juice is employed as instillation of ear ache. The roots of Grangea maderaspatana poir were collected locally and authenticated by reputed botanist. The air dried and powered roots (2 kg) Grangea maderaspatana poir, natural order composite was extracted with 95% aqueous ethanol and concentrated under reduced pressure. The concentrated ethanol extract was successively extracted with n-hexane, chloroform and ethyl acetate. The concentrated ethylacetate soluble part was subjected to TLC examination when it showed two spots. As such it was chromatographed over silica gel column using solvents with increasing polarity. The fractions collected from (chloroform: methanol) (1:1) gave compound B-1 which was found to be homogeneous on TLC examination. It crystallized from (chloroform: ether 1:1) as yellow needles . The compound B-1, analyzed for molecular formula C27H30O14, m.p. 211-212°C and M+=578(CIMS) and gave positive Shinoda test  and Molish test. The glycoside B-1 on acid hydrolysis with 7% dilute HCl gave an aglycone which analyzed for molecular formula C16H12O5 (found: C, 66.52; H, 4.25; Calcd: C, 68.01; H, 4.30). Ag2O (25 gm), and CH3I (2 ml) were added to a solution of B-1 (25 mg) in dimethyl formamide (2 ml). The contents were stirred in the dark at room temperature for about 50 hours. There after the mixture was filtered and the residue was hydrolyzed with 10% HCl. After usual workup it gave a partially methylated aglycone which gave bath chromic shift of 15 nm with NaOAc. The methylated sugars were identified as 2,3,5 tri-O-methyl-L-arabinose and 2,3,6 tri-O-methyl-D-galactose by (Co-PC and Co-TLC) which were separated by preparative TLC on Si-gel. The methylated aglycone, m.p. 200-201°C had molecular formula C17H14O5 and [M]+ 298, (found; C68.57, H 4.72; calcd. C68.45, H 4.69). A compound B-1 along with takadiastase (10 ml) was kept together in a round bottom flask (500 ml) at 25°C for about 50 hrs. There after water was added to it and then it was chromatographed over silica gel column to get proaglycone and L- arabinose (confirmed by Co-PC and Co-TLC). Further hydrolysis with enzyme almond emulsion it yielded D-galactose (column-paper chromatography) and a glycone. The quantitative analysis of the sugars(s) present in the glycoside was carried out by the Mishra and Rao  method, which indicated that two sugars were present in equimolar ratio (1:1) in the glycoside B-1. The compound (B-1) C27H30O14, m.p. 211-212°C responded to positively to Shinoda test and Molisch tests which established its nature to be flavonoidal glycoside. The IR spectrum of this glycoside showed strong absorption bands at 1656 (α, β unsaturated C=O), 2885 (OMe), 3612 (OH), 1055-1046 (glycoside C-O), 1610 and 1496 cm-1 (aromatic ring). A bathchromic shift of 55 nm in Band I with AlCl3-HCl showed the presence of hydroxyl group at C-3 in B-1. Acid hydrolysis of (B-1) yielded an agalycone and sugars galactose and arabinose. The agalycone had m.p. 196-197°C, it analyzed for C16H12O5 and M+=284. 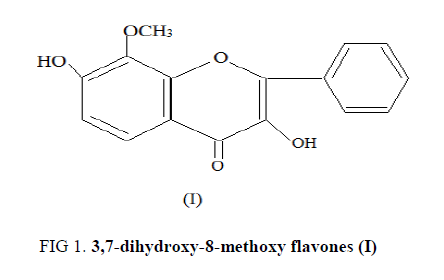 The aglycone was identified as 3,7-dihydroxy-8-methoxy flavones (I) by comparison of its m.p., UV, IR, 1H-NMR, and mass spectral data with those reported in literature (FIG. 1). Its 1H NMR, spectrum confirmed the presence of one methoxyl groups which appeared at δ 3.7 (3H), whereas two singlet’s each at δ 7.6 and δ 7.0 (for H-5 and H-6 proton). On the other hand, additional signals were also noticed for an ortho coupled doublet at δ 8.4 assigned to H-2′6′ and ortho coupled triplets at δ 7.3 assigned to H-3′, 4′ and 5′ protons in B-1. Also, two anomeric sugar protons appeared at δ 5.60 (1 H, J=9 H2, 1H-of galacose) and δ 5.34 (1H, d, J=1.2 HZ, 1H-of arabinose) respectively in B-1 . Permethylation of the compound B-1 which was done by procedure of khun et al. and kiliani mixture, yielded 2,3,5 tri-O-methyl-L-arabinose and 2,3,6 tri-O-methyl-D-galactose indicating that D-galactose and L-arabinose were present in B-1 . B-1 on enzymatic hydrolysis with enzyme Takadiastase yielded proaglycone and L-arabinose, (confirmed by Co-PC and Co-TLC), confirming that L-arabinose was linked to galactose through an α-lilnkage and also L-arabinose was the terminal sugar in the glycoside B-1. The proaglycone obtained as above on further hydrolysis, with enzyme almond emulsion, yielded D-galactose (Co-PC and Co-TLC with authentic sample) and aglycone further establishing the presence of β-linkage between D-galactose and aglycone. In mass spectroscopic analysis, significant fragment at m/z 167 showed the presence of two hydroxyl and one methoxyl group in the ring A of the aglycone B-1, while a fragment at m/z 105 showed the unsubstituted B ring. A bathochromic shift of 15 nm. with NaOAc in the aglycon B-1 established that the hydroxyl group was located at C-7 in it. Partial hydrolysis with killiani reagent gave proaglycone m.f. C22H22O10 m.p.-205°C, [M]+ -446, (FABS) which was identified as 3, hydroxy-8-methoxy 7-O-β-D-galactopyranoside by examination of its UV, IR, 1H-NMR and Mass spectral data [7,8] (FIG. 2). Figure 2: 3-hydroxy-8-methoxy flavones-7-O-α-L-arabinofuranosyl-(1→4)-O- β-D-galactopyranoside (II). The glycoside on permethylation followed acid hydrolysis yielded the methylated aglycone m.f.- C17H14O5 m.p.-202°C and methylated sugars [9-11]. The methylated sugars were identified as 2,3,5, tri-O-methyl-L-arabinose and 2,3,6 tri-O-methyl D-galactose. On the basis of above facts the structure of the glycoside (B-1) was assigned the structure as; 3-hydroxy-8-methoxy flavones-7-O-α-L-arabinofuranosyl-(1→4)-O- β-D-galactopyranoside (II). Chopra RN, Nayer SL, Chopra IC. Glossary of Indian Medicinal Plants. CSIR Publication.1956;pp:127. Shinoda J. A new biologically active flavone glycoside from the roots of Cassia fistula Linn. J. Pharm. Soc. Jpn. 1928;48:214-20. Yadava RN, Jain S. A new bioactive flavone glycoside from the seeds of Melilotus indica All. J Asian Nat Prod Res. 2005;7(4):595-9. Mabry TJ, Markham KR, Thomas MB. The systematic identification of flavonoids. Springer, New York. 1970. Newman DJ, Cragg GM. Marine natural products and related compounds in clinical and advanced preclinical trials. J Nat Prod. 2004;67(8):1216-38. Renato P, Oscars G. Phytochemistry.1984;23(6):1340-1. Staub AM. In method of carbohydrate chemistry ed. Whistler RL. Academic Press, New York. 1965;5:5-6. Tymimski A, Timell TE. The Constitution of a Glucomannan from White Spruce (Picea glauca). J Am Chem Soc. 1960;823:2823-7. Badal S. Oleam–12–ene–16–β–ol–28–oic–3–O–α–L Rhamno-pyranosyl–(1→4)–O–β–D–Galactopyranoside from the seeds of Grangea maderaspatana poir. Int J Chem Sci. 2012;10(3):1271-6. Badal S. Isolation and study of fat from stem of Eleusine corocana (Gaertn). Int J Chem Sci. 2013;11(2):850-4. Badal S. Eleusine Corocana (Gaertn) Stem fat-A potential antimicrobial agent. Int J Chem Sci. 2014;12(1):181-4.